Officials are investigating possible police involvement in the shooting. 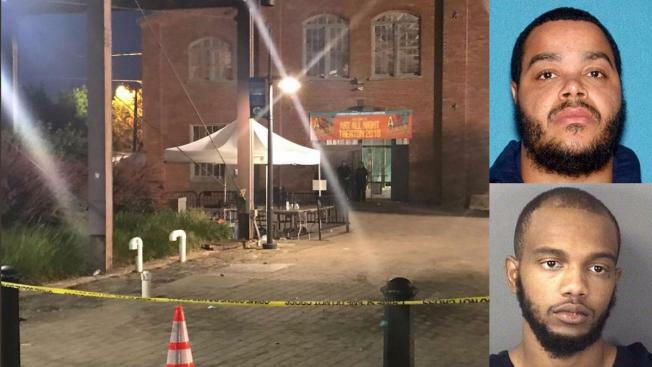 A suspect was killed while 22 people were hurt following a shooting at a festival in Trenton, New Jersey. The Mercer County prosecutor and community leaders are meeting Tuesday morning at a Trenton church to talk about ways to move forward after 22 people were shot in suspected gang violence at an arts festival over the weekend. The chaos broke out at the Art All Night festival in downtown Trenton around 2:45 a.m. Sunday, according to investigators. "Prior to the shooting, the Trenton Police Department began dispersing individuals," Mercer County Prosecutor Angelo Onofri said. "Those individuals, however, continued to loiter and additional fights broke out and then the shooting occurred." Witnesses told officials they heard people arguing inside the historic Roebling Wire Works venue moments before gunfire erupted. The fight soon spilled out into the street as attendees ran for cover. Police said multiple people, including Tahaij Wells, 32, and Amir Armstrong, 23, then opened fire at each other. At least 1,000 people were in the area at the time. "Everybody ran," one witness told NBC10. Another witness said he grabbed his girlfriend when the shooting started. "[It] just kept going," Franco Roberts said. Roberts said he helped one of the victims. "I just bent down and grabbed his hand and I was talking to him and I was like, 'Yo bro, don't close your eyes,'" Roberts said. Officials said responding police officers shot and killed Wells. He had been on parole since February for homicide, according to investigators. Armstrong, who is in stable condition, is charged with unlawful possession of a handgun, officials said. "The street is just flooding with people running, you know, unfortunately there was a girl who was shot in the leg, she was on top of my car," Samuel Kanig, another witness, said of the melee. At least 22 people were injured during the ordeal. Officials said 17 of the victims were shot while others who were hiding behind cars during the shooting were hurt when the vehicles began to move. Police are also investigating an attempted carjacking in an alley behind the venue. Investigators have not yet determined whether it was related to the shooting. Investigators recovered multiple weapons after the shooting. One weapon was a handgun with an extended capacity magazine that contained more ammunition than permitted under New Jersey law, officials said. Irvin Higgenbotham was released from the hospital after suffering multiple gunshot wounds. "I don't wish it on nobody," Higgenbotham said. "The kids out here, these guns and stuff, it's no good." On Sunday morning, hours after the shooting, crime scene tape surrounded the venue, a historic warehouse building that now shares a parking lot with a supermarket, bank and laundry facility. People could be seen dropping off flowers for the victims throughout Father's Day. Theresa Brown said she's been volunteering at Art All Night for 12 years and has never seen or heard of violence like this. She said she was leaving her volunteer shift around 2 a.m. and heard "pop, pop, pop." Speaking to reporters on Sunday, New Jersey Gov. Phil Murphy said he was troubled the shooting happened just days after he signed tougher gun laws into legislation. "This is yet another reminder of the senselessness of gun violence," he said. "For those responsible, we will bring the full extent of the law and justice to bear on them." Art All Night Trenton began Saturday afternoon and was scheduled to conclude Sunday afternoon. The remainder of the festival, which promoted "community, creativity and inspiration," was canceled. Local, state and federal law enforcement officials are working together in what has become a multi-agency investigation. Officials are also looking into whether police fired their weapons during the incident. "My sympathy goes out to the victims and their families," Trenton Mayor Eric Jackson said at a Sunday morning press conference. "All shootings are a crisis. This is not just a random act of violence - this is a public health issue." In the wake of the shootout, Trenton public schools, noting student safety, issued a shelter-in-place declaration until further notice.